Happy Boy’s Day to all the other Buddys out there! Me and my little guy had quite the adventure today, as this morning when we were getting ready to leave I realized that I’d left my keys on the kitchen table and he’d closed the door behind him. We were stuck! Without keys, we couldn’t get to school, so we ended up getting on our bikes and biking all the way to Daddy’s office. 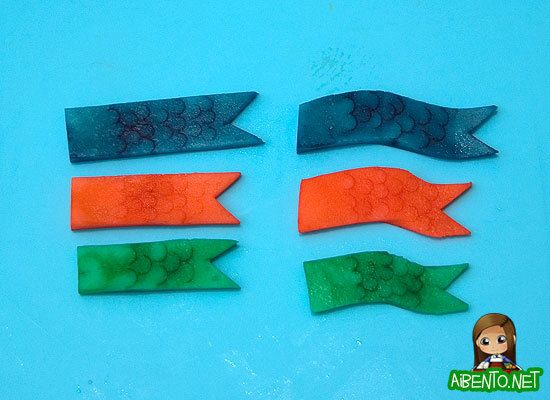 Today I’m going to show you guys how to make kamaboko carp with scales. People who don’t have access to kamaboko can use painted white cheese slices, though I’m not sure how well the scales would come out. 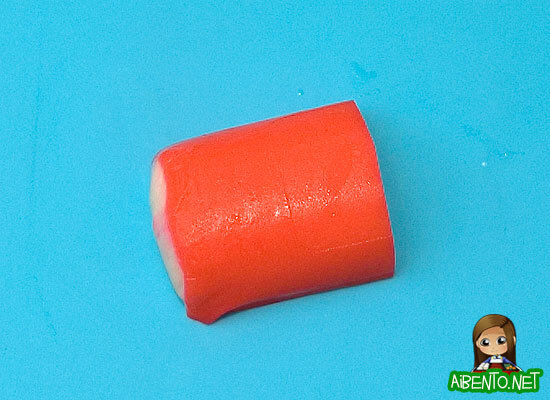 Start with a piece of kamaboko block. From here, you’ll need to turn it on the side and cut a few thin slices. You could probably make three carp with just two slices, but I wanted to make two different kind to show you guys, so I cut four (fourth not shown because I cut it after realizing three wasn’t enough). Next, cut them into carp shapes of decreasing sizes, cutting a little notch at the end for the tail. 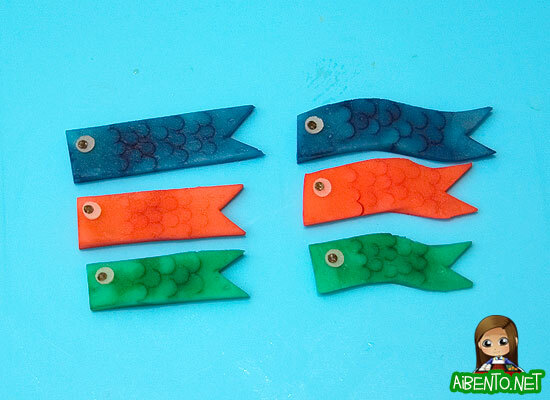 You can also make a wavy cut for a carp blowing in the wind. Here you can see I made two sets, one wavy and one straight. Next, we cut the scales. 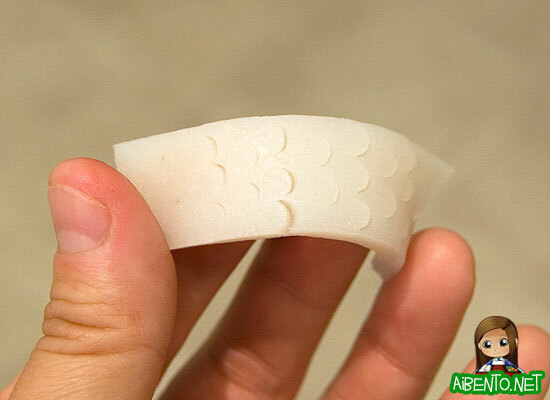 Cut off a piece of drinking straw and then cut it in half, so that you have a half moon shape. Yes, I bite my nails. I’ve been unable to stop since the first grade and work has been stressful lately. Anyway, poke this piece of straw into the carp in alternating rows. Pinch it to make smaller scales on the little carp. This is what the scales should look like. 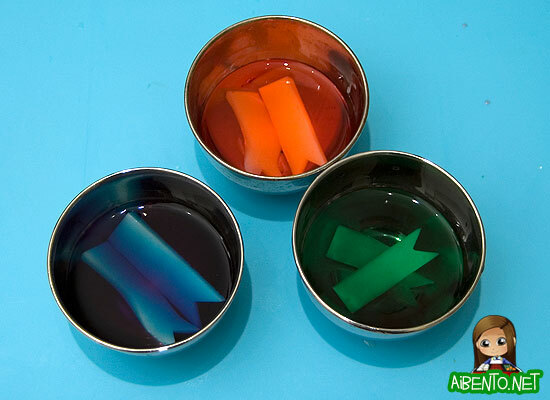 Now, prep three little bowls with some water and put 2-3 drops of food coloring in. I used blue, red, and green. 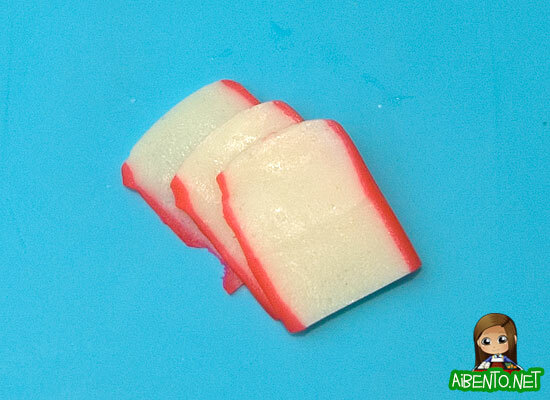 Soak the kamaboko in the colored water for maybe 10-15 minutes. After they’ve got some color, you’ll need to make the scales stand out. Take the carp out and curl them to expose the insides and then drip food coloring on into the scale cuts. Rinse off the carp immediately as you don’t want the outside of the fish too dark. Dry off the carp with paper towels and you should now have carp with scales! From here, all you have left to do is make the eyes. 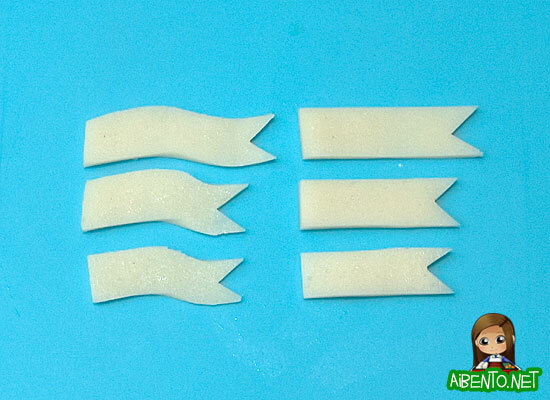 Take another piece of drinking straw and cut out circles from the leftover kamaboko. Use a knife to slice the circles thinner and then dot them with nori punched eyes. For a flagpole, use a piece of uncooked spaghetti and then put them all on top some flattened rice in a bento or for dinner tonight, since I’m posting this a bit too late for people to put them in lunches. 🙂 In a bento, the moisture from the rice would soften up the flagpole to be an edible noodle at lunch. Hope you guys enjoyed that tutorial and hope your boys have a great Boy’s Day!